Jarvis Williams- A Change Gon Come! Many people may have never heard of Jarvis Williams. That will not stop him from pursuing his goals in life…..it never has! As I spoke to the future NFL player (I’m claiming it already) and heard him continuously refer to me as sir, I sensed a certain amount of humility that is sometimes atypical of athletes. I quickly realized my intuition was accurate once we began discussing his outlook on life, athletics, and becoming a professional football player. Although Williams grew up around athletic siblings, he didn’t begin playing football until high school. Even though he was good at football and had begun to grow in stature, he struggled with the academic requirements of school. As a result, even after leading his Byrnes High school football team to win back-to-back South Carolina 4A Division state titles, Williams had to attend Antelope Valley Junior College in California. It’s not a forgone conclusion to think most football fans might not be able to identify with Antelope Valley. Williams didn’t see it that way though. He was determined to be the best defensive end he could be. Although at the time his life wasn’t exactly everything he had hoped, he was never impervious to hard work. He saw his mom work hard to take care of her family and with her as his role model he naturally adopted that same work ethic. Sure, Antelope Valley did not have top notch facilities and world class trainers but Williams saw his stint at the Junior College as an opportunity. He used his time there to become a man. “I had to be strong minded,” Williams recalls, “I had to make something out of nothing the legal way.” He was forced to find ways to become stronger, faster and quicker. He had to be responsible and pay bills even though he didn’t have a full ride scholarship or an abundance of money. On cue, Williams played in all 12 games with seven starts at defensive end as a junior for the Panthers. That was only the beginning. In his 2016 senior campaign, Williams led the Panthers in sacks and tackles for loss to conclude his collegiate football career. He has already graduated with a degree in Sports Management however the 6’1 and 255 pounder commonly referred to as “Big Country” is still hungry for more. Williams prides himself on his competitiveness, self confidence and commitment. He understands that he has to hurdle over more obstacles than the other Division I players because of not getting the exposure. He’s always let his play on the field become his interview for scouts. His first quick step and get-off-the-ball allows him to bypass most offensive linemen. “My best attributes are my effort, my work ethic, high motor and dog mentality,” says Williams. His high motor and dog mentality is evident in his “don’t stop until the whistle is blown” play on the field. He has a knack for not only getting sacks and tackles-for-lost but also collecting tackles beyond the line of scrimmage. Williams has also been affective on wide receiver screen plays and even plays where the ball carrier broke a long run. 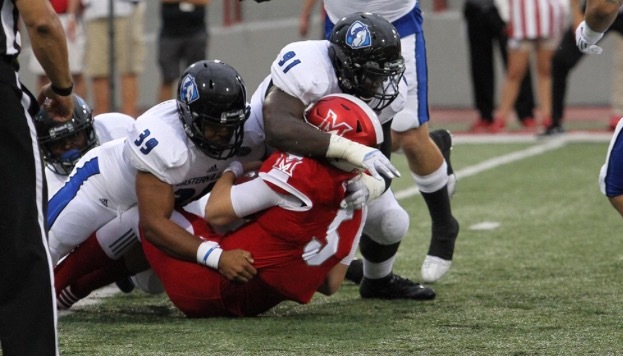 The Eastern Illinois graduate never stops his pursuit and records tackles down the field. Many have said that Williams is too small to play defensive end in the NFL. This is one of the reasons he looks up to Pittsburg Steelers outside linebacker James Harrison. Coming out of Kent State, critics felt Harrison was too short and too small to play linebacker. Harrison was picked up by the Pittsburg Steelers as an undrafted free agent and has since created a successful career for himself. These type of examples coupled with a strong work ethic he got from his mother has enabled Williams to remain unfazed by the challenge. “I have always been undersized but it doesn’t matter if you put the work in, that will separate you,” says Williams. He has already trimmed down 15 pounds from his playing weight of 270 and has begun training in Chicago to work on his technique in preparation for a position change at the next level. Perhaps he will play linebacker like James Harrison. He has learned not to set boundaries on his life. It is apparent that Williams is a goal oriented young man. From the sticks of Greer, South Carolina to sacking quarterbacks in the Ohio Valley Conference, Mr. Williams is determined to make his presence felt. He wants to help out other athletes with the same type of humble beginnings that he endured. He aspires to provide young football players the wisdom and football knowledge he obtained through all of his football and life experiences. He could see himself as a coach one day however, he is not focused on plan B right now because plan A is staring him right in the face starting with the NFL combines followed by the draft.